The Golden Age of Hollywood was the era of Humphrey Bogart and Ingrid Bergman battling the Nazis, when Joan Crawford in Mildred Pierce and Barbara Stanwyck in Double Indemnity were the gorgeous stars of film noir. Grand Rapids Symphony remembered Old Hollywood with “Symphony Noir,” a swanky evening of old-style glamour and good times that was the cat’s meow. Well-dressed dreamboats and dolls were greeted with a glass of champagne as they stepped off the red carpet at the gas of an evening at New Vintage Place on April 25. Not everything was a throwback at the event sponsored by Meijer, MLive, Steelcase, Mary Ann Keeler, Witness Inspection, Jandernoa Foundation, Grand Valley State University, Stevens Advertising, Pioneer Construction, Bob and Julie Connors, Anthony and Linda Foster, and John Hunting. The latest technology allowed guests to bid for thingamabobs in a silent auction to raise a little moolah for the orchestra’s Gateway to Music. The matrix of 16 music education and access programs serve 86,000 students, adults and families, reaching over 200,000 people across 13 counties in West Michigan each year. A humdinger of a program, well worth a few clams, if ever there was one. 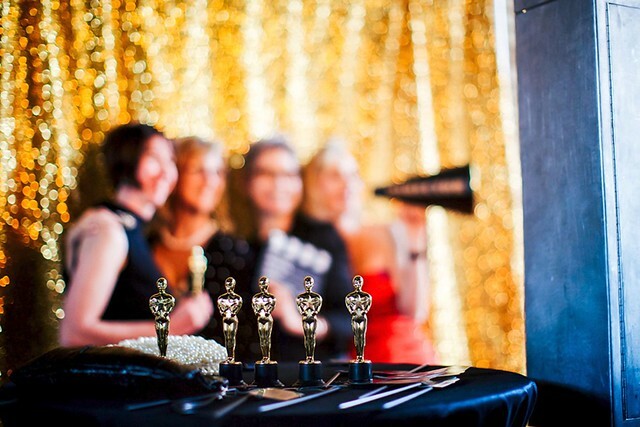 A strolling dinner and a photo booth were part of the killer-diller evening for the glitterati. So if you weren’t there, fix your peepers on these photos and see what you missed. Meanwhile, don’t snap your cap. We’ll do it up again next time. And now you’re in the know.